Let's look at these five catalysts to failure and how they can be overcome. Abandonment : Little James Earl was scared. His father had left the family to become a prize fighter and actor. His mother had left to earn money as a tailor. The Great Depression had stolen his family and he was about to lose the only life he had ever known. His grandparents had adopted him and now they were on their way to Michigan. Rejection : Though his life in Mississippi had been one of abandonment, it was all the 5-year-old boy had known. The move to Michigan so traumatized him he developed a stutter. James Earl was completely mute  with the exception of conversations he had with himself when he was all alone. He found solace in the written word  creating poetry to release the raging in his soul. Judgment : As is often the case, one person who saw beyond his limitations released James Earl from his self-imposed prison. That one person was an English teacher who saw talent in the silent 13-year-old. She pushed him beyond his fear by forcing him into public speaking  insisting he recite a poem in front of the class every day. Can't you imagine his terror when he first stood in front of his classmates? What made him do it? Was it only the teacher's insistence? No. It was a deep desire to break free from his prison and speak all the things that had sat silently in his heart during all those years. He chose to feel the fear  and then do it anyway! Failure: He stuttered. He stammered. He endured the sympathetic and scornful looks of fellow students. He endured the laughing. But he did it. He faced the fear and forced himself to speak. Day after day. Week after week. He hung onto the encouragement of the teacher who believed in him. And it worked. His stuttering became less. He learned to control his voice. Responsibility : His victories made him look for more challenges. James Earl began to take acting lessons. His early lessons in perseverance gave him the courage to push beyond the prejudices against black actors. He chose to take as many different types of roles as he could  stretching his limitations and refusing to be pigeon-holed by any stereotypes. James Earl Jones is now known for his deep authoritative voice. Perhaps you know him as the voice of Star War's Darth Vader, as Mufasa in the Lion King or the booming voice behind the cable news network heralding "This... is CNN". Today, Jones can also count the entertainment industry's "grand slam" of Emmy, Grammy, Oscar and Tony Awards among his many accolades: Emmys for "Gabriel's Fire" and "Heat Wave"; a Grammy for "Great American Documents"; a Tony for the Broadway version of "The Great White Hope" and "Fences"; as well as an Oscar for lifetime achievement in 2011. People look at him today and see a confident actor with a deep, resonant voice. The next time you see him, look deeper. 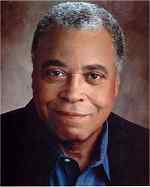 . .
James Earl Jones' great secret to success is that he chose to push beyond his fears. He chose to change the reality of a young boy who had lived in silence for eight years. He chose to face ridicule and scorn in order to be free. I can only imagine how many years passed before he could open his mouth without being afraid of what would come out. So many of us let our fears stop us. We're afraid of how we will appear. We're afraid of what people will think. We're afraid we'll fail. And so. . . we do nothing. We exchange fear for regret. Fear will pass. Fear can be conquered. Fear will fade away in the face of determined action. Regret  well, you'll live with that for the rest of your life. What are you afraid of ? Name the fear. Choose to face it. And take action to conquer it today! You, too, can live a life of success by feeling the fear and moving beyond it. The story for this article was taken from Ginny Dye’s Daily Secrets For Success.